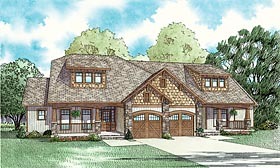 Answer: Thank you for your interest in our home plan design. This multifamily home plan is a very unique layout. The dormers are shed roof dormers however there is no vault in the floor plan, so the dormers are false dormers for exterior appeal. Usually vaults can start from the plate line of the home plan and go as high into the attic as space will allow; using the dormers as a source of natural light into the floor plan, you may also consider placing a high ceiling onto the plan. This will probably require the rise of the plate line which is now at 9’; if cannot be done on site, you may inquire about having the designer to make changes to plan to create natural light to enter onto plan from shed dormers.